Annie Kwok appeared on Show 170, recorded in November 2007, at age 12. 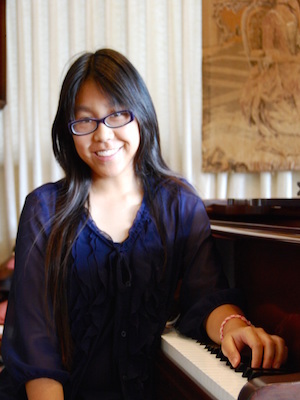 ANNIE KWOK is a classical piano performance major from Honolulu, Hawaii. She began piano lessons at age four and joined the late Ellen Masaki’s studio in 2004. Under Mrs. Masaki’s guidance, Annie placed in numerous competitions such as the MTNA competition and the Aloha International Piano Competition. She has also performed as a soloist at age 9 with the Windward Ensemble Group and with the former Honolulu Symphony at age 13. Annie has worked with pianists such as Norman Krieger, John Perry, Leon Fleisher, and Menahem Pressler. In 2014, Annie performed as a soloist in NEC’s Pianists: Start the Revolution with Me concert in Jordan Hall. She currently studies with Bruce Brubaker, Chair of the piano department at the New England Conservatory. Annie is a member of the Center for Development of Arts Leaders (CDAL) in Boston.